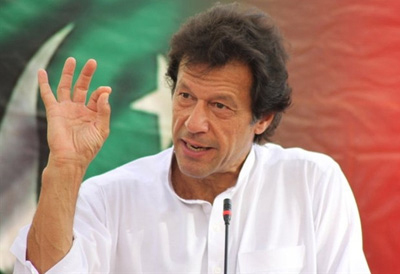 Pakistan Tehreek-i-Insaf (PTI) Chairman Imran Khan told media on Monday that the government and critics of the Raiwind march would be surprised to see an entire nation supporting his party in protest. During a press conference in Bani Gala near his residence, Khan confidently said how many people would attend PTI’s march in Raiwind would be revealed on the 30th of this month. He said a peaceful protest was his party’s democratic right particularly after state institutions failed to provide justice on repetitive occasions. However, Khan also warned that if the government or Pakistan Muslim League-Nawaz (PML-N) workers tried to disrupt the flow of the march, officials would not be able to stand the reaction. PTI would follow every course of action that works within the framework of law and constitution of Pakistan, said PTI Chairman. Khan reiterated that as far as the issue of Panama Papers scandal was concerned, all major political parties in the country were on the same page and PTI had encouraged them to join the protest. What are the objectives of the march? 1) is it corruption 2) Is it Poll rigging 3) Is it street power after losing the ballot power. Who is the brain behind this misguided march. Who is power behind Imran. I struggle to find answers to these questions. It is a well known fact that in any capitalist country like Pakistan Rich and Famous will always be a powerful force in politics and we the poor people will dance to their tune. Imran is no different. He is rich and famous and has his own agenda like shaking the roots of the country but it is not going to happen. Pakistan is no banana Republic .Renting a crowd is no big deal in Pakistan.